In a small town in Bowden, Australia, a collaborative street art team is growing at an alarming rate. They’re known for not sitting still, media-wise, and coming up with striking new works from materials as varied as coloured cups, toy soldiers, and yes, even chewing gum. Like many street artists today, Hyde & Seek are eschewing public identities to just let their work speak entirely on their behalf. Well, that’s not entirely true. Hyde & Seek has a large online presence: Facebook, Tumblr and Twitter are all filled with their work, including plenty of cross-postings and their own extensive Facebook photo collection. The pair, we assume it’s a pair because of their wording in posts, have documented a bit of their process, but they also just love close-ups to show off the technical side of their work. Mixed media may be the best descriptor of Hyde & Seek’s work. It started with Chew Barrymore, which gained a sort of viral status in the online street art community, and went from there. Chew Barrymore was a portrait of the actress made entirely from, well, chewing gum. It’s a bit of a marvel, not just for its chosen medium, but because the portrait wears their most immediate influence on their sleeve: Andy Warhol. The bright colours combined with washed-out aesthetics falls right into Warhol’s chosen palettes for the many portraits he did over the years. Of course, I think Hyde & Seek decided not to do the repetition probably to avoid sore jaws! After their strong debut, Hyde & Seek have shown up in a number of places in what we imagine to be their hometown. The most recent being an affinity for fences. Two pieces have shown up in the past few months. The first, a woman blowing the petals of a flower, made entirely from coloured cups shoved into a chain link fence. They pushed the idea a little further with their most recent project: a series of coloured swatches also lodged into a chainlink fence. The result is a beautiful eye in a detailed background. Both expand the canvas on which street art can happen. Chainlink fences are most famous for their transparency and ability to collect trash, not as a place for striking, and opaque, artwork. Perhaps my personal favourite Hyde & Seek piece is their piece using tiny toy soldiers. You know, the green ones in Toy Story with the fixed bases? The team gathered a bunch of these and made a painting of a man break dancing. Dance, as Brazilian Capoeira teaches us, is often linked to resistance and fighting, even as it remains an intrinsically passive mode of resistance. The juxtaposition of the break dancer and the soldiers from which he is created highlight the relationship between war and dance. 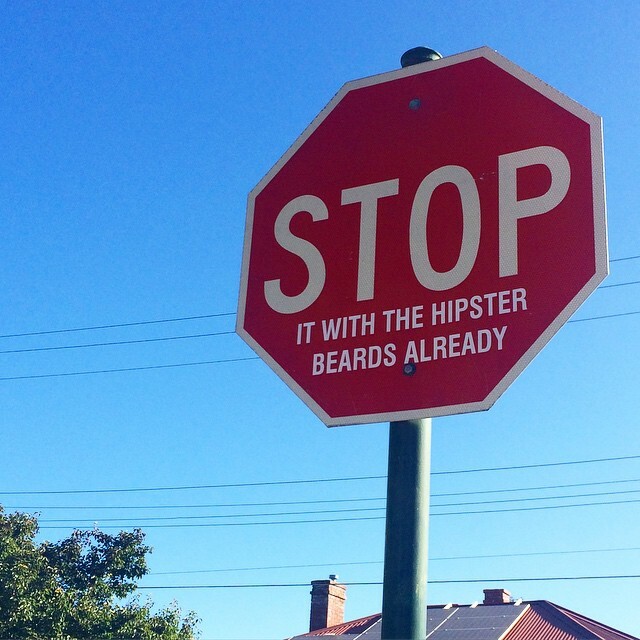 Of course, Hyde & Seek’s most “sharable” pieces are their Stop signs, which paste additional words onto stop signs for some humour or calls to stop growing hipster beards. Snarky, decontextualized, and smirk-worthy, these signs have been showing up all over. Now hopefully people aren’t stealing them, which can sometimes be an issue for defamed street signs, which is never good for drivers. Hyde & Seek are on their way up despite keeping their identities very quiet. Be sure to keep an eye out for their next imaginary use of some completely new and underused materials.